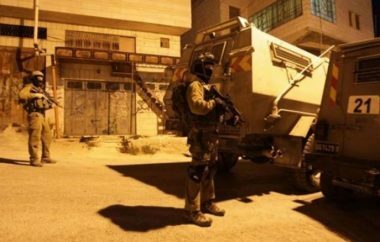 Israeli soldiers abducted, on Thursday at dawn, two Palestinians in the northern West Bank district of Jenin, and two others in Tubas district, in the northeastern part of West Bank, during massive invasions and violent searches of homes. The Jenin office of the Palestinian Prisoners Society (PPS) said the soldiers abducted Omar Hosni Ghawadra, 22, from Bir al-Basha village, south of Jenin, while he was on his way to his workplace, and moved him to an unknown destination. It added that the soldiers also abducted a young man, whose identity remained unknown until the time of this report, after stopping his car and confiscating it, near the Salem Israeli military base, west of Jenin. The Palestinian was driving at the intersection between Zabbouba and Rommana villages, when the soldiers stopped his car, and abducted him. The soldiers also invaded Tubas city, searched a few homes and abducted a former political prisoner, identified as Samer Sameeh Sawafta, and a high-school student, identified as Saher Anees Abu Mohsin. In related news, the soldiers abducted thirteen Palestinians in the West Bank district of Bethlehem, twelve of them from their homes in Aida refugee camp, and one in Husan town. Furthermore, several Israeli military vehicles invaded Shu’fat refugee camp, in Jerusalem, and clashed with many youngsters, who hurled stones and empty bottles on them, while the soldiers fired many gas bombs and concussion grenades.